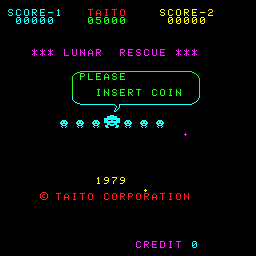 Lunar Rescue - your mission is to save the astronauts stranded on the surface of a rocky planet. You must drop your landing pod from your mothership, guide your ship to the rocky planet's surface avoiding the asteroids and land on one of the platforms. One of the stranded astronauts then runs into your ship and you must then return him back to the mothership by docking your landing pod at the top of the screen. 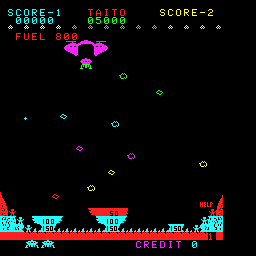 However, this time there are no asteroids to contend with; they have all transformed into alien ships! 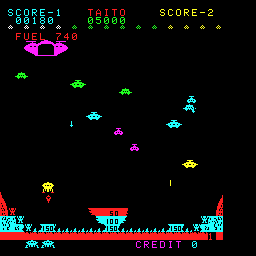 Luckily, your ship is armed with a laser and you can destroy the alien ships. Rescue all of your astronauts and you advance to the next harder level. The platforms you have to land on on the planet's surface are three different sizes with their points value marked on them, and they are stacked on top of each other. Once you rescue an astronaut from a top platform, it disappears and you have to land on the next smaller platform to rescue your man . On your way down you have a limited fuel supply which you can use to fire your thrusters to slow your descent. YOu must land on the platforms or you crash into the rocks. On your way back up, you can increase the speed of your ascent by using your thrusters again. On your ascent you do not use fuel by firing your thrusters. When you get close to your mothership, the docking bay doors open and you must fly inside to safely deposit your rescued astronaut. On later levels your ascent may be impeded by huge meteors falling down diagonally across the screen, which you must avoid. Small alien ship: 50 points. Medium alien ship: 30 points. Large alien ship: 30 points. Landing on Large Platform: 50 points. Landing on Medium Platform: 100 points. Landing on Small Platform: 150 points. End of level bonus: 50 points per man rescued x level. Try to land on the smallest platforms first, as saving the larger ones will make the later part of the stage easier, when the asteroid field is more dense and the enemy ships more numerous. Asteroids can not hit you at the extreme edges of the screen. Alien ships can only fire from their centre, whereas you can hit their edges. Use your speed advantage to move under them, fire quickly and move away before they shoot. Don't be too conservative using your thrusters on your descent, as you have plenty of fuel.